John and Alice Coltrane covers may seem to be a bit off the wall for Fruits de Mer, but the two entries on this single only reinforce how the label keeps coming up with great ideas that work. Superfjord are a Finnish band who are new to me. The promo sheet explains that they recorded a cover of John Coltrane’s A Love Supreme for their It Is Dark But I Have This Jewel album, and it’s presented here with a new intro. This is really cool. Superfjord funnel the jazz legend through a Woodstock meets Krautrock filter by creating a late 60s west coast Psychedelic vibe á la Airplane/Dead, but adding deep space atmospherics and a repetitive chant that brings to mind a Faust song I can’t recall the title of. It’s an intriguing blend and a cosmic interpretation of this jazz classic. Earthling Society included a 15 minute cover of Alice Coltrane’s Journey In Satchindananda on their latest album, England Have My Bones, and for this single they offer up an 8 minute “Cosmic Joy Mix” of the song. 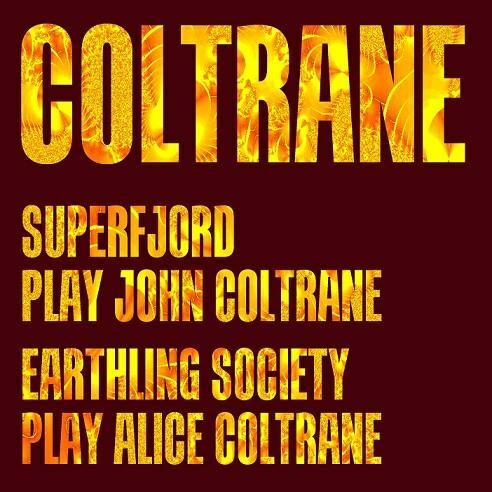 The band open their homage with the same sitar-like drone as the original, maintaining the same slow melodic riff, pace and jazzy feel as Coltrane, but taking it into trademark Earthling Society heavy Psychedelic Space Rock territory. The bass and drums continually recall the original, but the guitar and alien effects are busting out in space, culminating in a cosmically acidic, surrealistically swirling finale. Note that those who purchase the single also get bonus CD with 70 minutes of music. The CD wasn’t included with the promo so I’ll quote from the Fruits de Mer web site describing its contents – “A remix of Superfjord’s track by Astralasia, a live version by Superfjord, a remix of Earthling Society’s track by Skam label’s VHSHead, two new recordings by Superfjord and Astralasia that are inspired by John Coltrane’s music, and an epic new song by Earthling Society that isn’t – maybe it’s not such a little bonus after all”. The single will be available late November and is limited to 700 copies. As usual this is vinyl ONLY, no CDs or downloads (other than the bonus CD). If interested you better hurry because Fruits de Mer releases sell out QUICK!